Continuing our Easter Break journey, we took an early morning train from Budapest down to the capital of Croatia - Zagreb. We met up with our friends, Katie and Patrick, to spend a week driving along the Dalmatian. 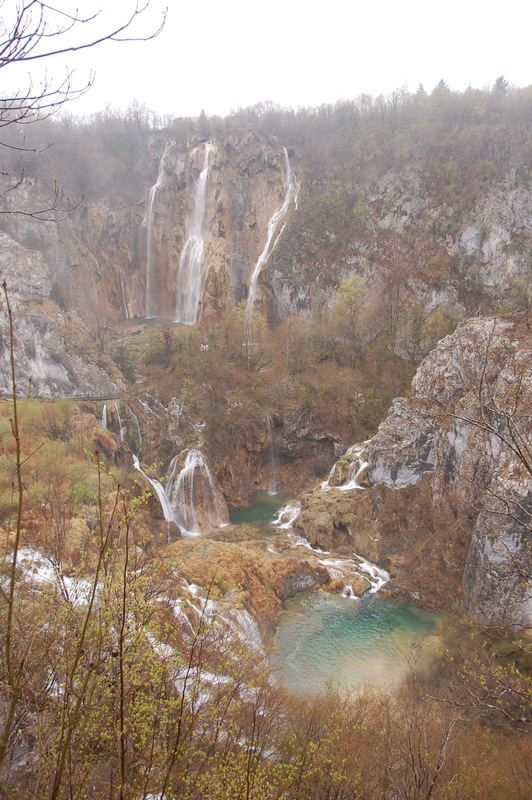 We only spent an afternoon in Zagreb, which seemed to be enough, before heading off towards the beautiful Plitvice National Park (pronounced PLEET-veet-seh). This post covers those two stops on the trip. Ilyrians (modern-day Albanians), Greeks, and Romans first settled various towns along the coast that stayed until the fall of the Roman empire in the 5th century. At that point there was a flood of barbarians and Slavs throughout Europe. Slavic Croats had control of most of Croatia by the 7th century and in 925 AD a guy by the name of Duke Tomislav united the tribes into a united kingdom. From the 12th century Croatia was ruled by foreign powers such as the Byzantines, Hungarians, Venetians, Ottomans, and eventually the Habsburgs (from Austria). All of this shifting of power left the Balkans a huge mixture of ethnicities and religions. The three major divisions were: Catholicism (from Charlemagne and the Habsburgs), Eastern Orthodox Christianity (from the Byzantines), and Islam (from the Ottomans). 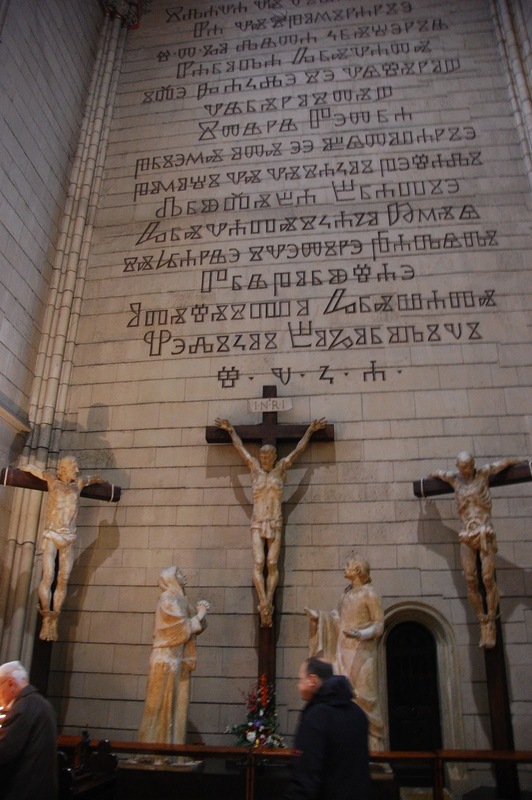 The ethnicities that emerged were: Croats and Slovenes (Catholic South Slavs), Serbs (Orthodox South Slavs), Bosniaks (Muslim South Slavs), Hungarians and Albanians. More in the next post. 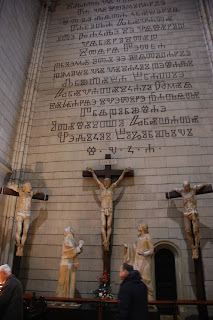 In one of the churches in Zagreb they had an inscription in this cyrillic language that the Croatians considered adopting when they gained their independence from Yugoslavia. It's a tradition in this region to hand-paint eggs for Easter and to give them to friends/family. 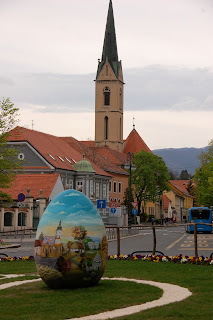 In Zagreb and other cities we came across these eggs on display in public plazas. More eggs in Zagreb - sort of like the Cow Parade if you've seen that in other cities. After doing lunch and walking around Zagreb, we took a 2-hour drive out to see Croatia's most popular national park. Little did we know that we would be hit with some cold, nasty weather the next day! 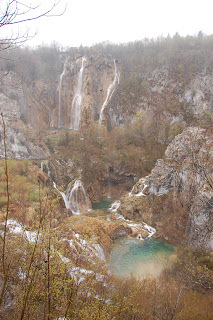 Plitvice National Park - still breathtaking even in the crappiest of weather (sleet/snow). It's basically a huge system of lakes and waterfalls made from travertine, a mineral similar to limestone (calcium carbonate). The lakes are all so clear because the bottoms are all covered by this stone, rather than mud. The good news was that there weren't that many people as stupid as us to brave the elements. That kept the paths reasonably clear. They have built an extensive network of wooden walkways that literally go across the lakes and waterfalls. It took us probably 3 hours or more to make our way around the whole place. I can't imagine what it would be like in the summertime with busloads of tourists walking single-file along the wooden pathways! So despite the weather we had a memorable time in one of the most beautiful natural wonders I've ever seen. Ironically, it was at this very park that the first shots (and casualties) of the fighting between the Croatians and Yugoslavia took place on Easter Sunday of 1991. The Serbs occupied the park until 1995, which actually helped the park to recover from the impact of tourism.